The successor to the proven and popular Radalert 50, the Radalert 100X is a digital pocket Geiger counter designed for general purpose monitoring of radioactivity. It detects Alpha, Beta, Gamma and X-radiation, visually shown on a highly accurate digital display with readings in your choice of both CPM (to 110,000 counts per minute) and mR/hr (up to 110 mR/hr), or switchable to the international standard of µSv/hr (up to 1,100 uSv/hr). A red LED blinks and a beeper chirps with each radiation count. The audio chirp can be turned off. The Radalert 100X derives its name from an audible alert that sounds when the radiation reaches a user-adjustable level. Play this sound file. The picture at right shows that adjustment on the top of the unit, next to the screened open end window over the Geiger-Mueller tube. The Radalert 100 also can be set for a Total Count, which will accumulate the radiation counts over time. This is a useful feature especially for establishing your background radiation level. As an example, you can set the unit to Total, and after say 10 minutes, divide the Total Count value by 10 to arrive at your background radiation in CPM. This unit also has a Data Output port to record counts on a computer or data logger, as shown in the picture at right. Click on this link for more on the on data output, and the optional Software accessories. Also note the same port Audio out for external sound. The Radalert 100 runs on a single 9 volt alkaline battery (included) which will last up to three months on continuous use at background levels. 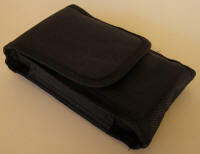 The Radalert also comes with a padded nylon carrying case with belt loop, shown at left. The Radalert also comes with perhaps the best Operation Manual of any Geiger counter in our class - in printed, booklet form, and very user friendly and thorough. Scroll down for detailed Specifications on the Radalert 100X. The Radalert 100X is a very popular unit. If you want an all-around excellent Pocket Geiger Counter with a digital readout versus an analog meter, along with a user adjusted audible alert, and/or desire a data port, we recommend this unit. The Radalert 100X typically ships within 1 business day. For complete operating instructions please download the complete manual above. For measuring mixed alpha, beta and gamma radiation, use the CPM (Counts per Minute) mode. This will give you a relative reading of all radiation combined. Refer above for complete specifications on the instrument’s sensitivity to various types of radiation. Switching between mR/hr and µSv/hr: Utility Menu is accessed by pushing the + button while turning the instrument on. The instrument will display “Menu 1.” Press the + button again to advance to “Menu 2.” Press “Set” to enter Menu 2. You can now scroll between mR/hr and µSv/hr. Select the units you would like to use and then press “Set.” Turn the instrument off and then on again to activate the new setting. 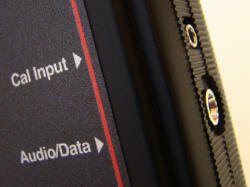 While in a dose mode (CPM, CPS, mR/hr or µSv/hr), Press the “Set” button on the end panel. The numeric display shows the current alert level for the current setting. The radiation symbol and SET icons will also be displayed. Use the + and – buttons to adjust the level up and down. When the desired alert level is displayed, press the “Set” button again to save the level and continue in Alert mode (the SET icon is no longer displayed). The radiation symbol is displayed to show that the instrument is in Alert mode. To turn off Alert mode, press the “Set” button once. This product is warranted to the original owner to be free from defects in materials and workmanship for two year from the date of purchase, except for the Geiger tube, which is warranted for one year. The battery is not included in the warranty. IMI will repair or replace your instrument if it fails to operate properly with this warranty period provided it has not been subjected to misuse, abuse, or neglect. Modification or repair of this instrument by anyone other than IMI or their approved repair facility voids this warranty. IMI is not responsible for incidental or consequential damages arising from the use of this instrument. Contaminated instruments will not be accepted for servicing at our repair facility. The user is responsible for determining the usefulness of this product for his or her application.